Set in the heart of the Hotel Zone, Hotel Riu Palace Peninsula attracts both families and couples with its polished, contemporary decor and buzzing atmosphere. Big, stylish guest rooms have bathrooms with twin sinks, hydro-massage bathtubs, and walk-in showers. Floor-to-ceiling glass doors open onto balconies or terraces with ocean views. Premium liquor is dispensed from special cabinets with spouts, while mini-fridges hold mixers, water, and beer. By day, the resort’s all-inclusive rates include activities like beach volleyball, windsurfing, kayaking, and snorkeling. By night, entertainment ranges from live piano music to comedy performances. The lively pool area includes four large pools, one of which features submerged loungers. There’s a designated adults-only pool as well as an activity pool with volleyball and basketball nets. The resort’s gorgeous beachfront is split into one section with soft sands, and a second section that’s more rugged and rocky but equally scenic. Children age four to 12 can enjoy movies, crafts, and games at the kids’ club, which includes a great pool. Dining is a highlight here, with the resort offering a buffet-style main restaurant and five themed restaurants. Las Olas, the buffet restaurant, features live cooking stations where guests can watch dishes being prepared. The themed a la carte restaurants, which range from Japanese fare at Kabuki to Italian cuisine at Venecia, feature striking decor and impressive menus. Guests can snack on light meals at the 24-hour Sports Bar or enjoy sweet treats at Capuchino. There are plenty of places to grab a drink, including a chic ocean view lobby bar and a casual swim-up bar. 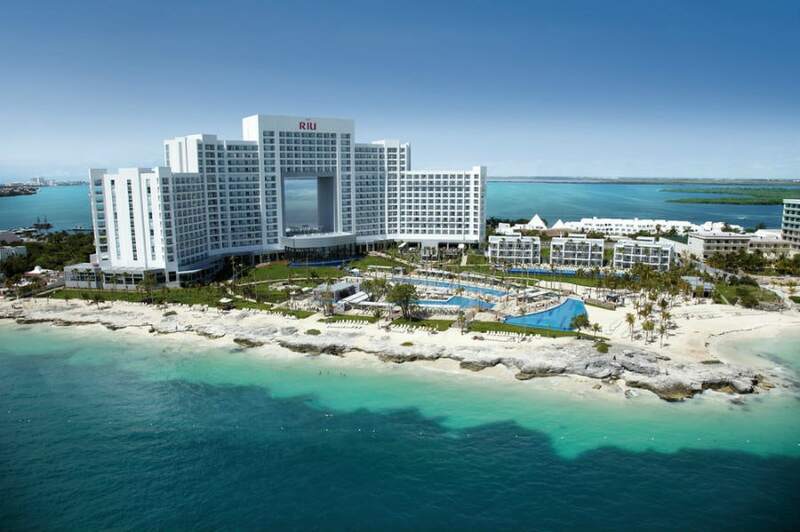 For more information, visit Riu Palace Peninsula’s website.